The death of Lexie’s brother at Pearl Harbor is the last straw for her mother and she dies shortly after. 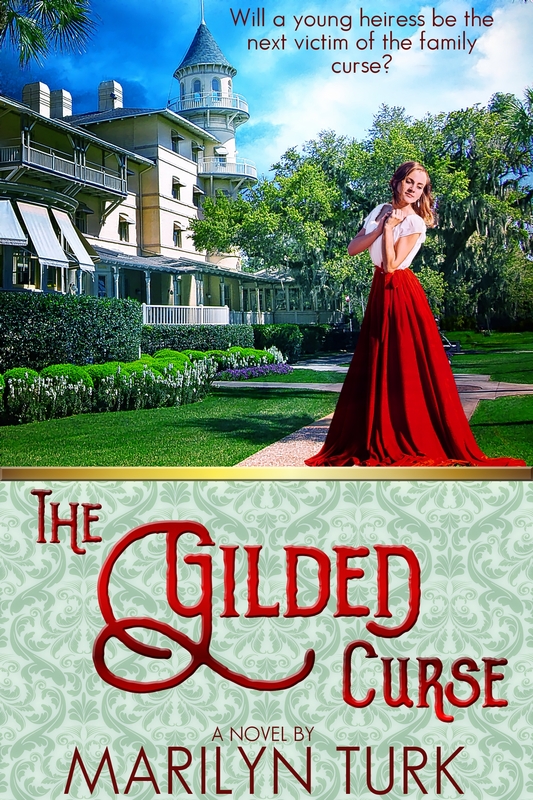 A telegram from a childhood friend, Russell Thompson, draws Lexie back to the Jekyll Island and the vacation home she, as the last surviving family member, can no longer afford. The home, Destiny, has fallen into disrepair and must be sold. Lexie slips back into her friendship with her brother’s friend, Russell, but her property makes her feel uneasy—even fearful. Rumors say that Destiny is haunted, though unlocked doors and smashed furniture inside suggest someone living does the haunting. I enjoyed this historical romance, especially learning about the fear Americans faced after the bombing of Pearl Harbor. I recently ran across The Fannie Farmer Cookbook in an antique store. This book was originally published in 1896. 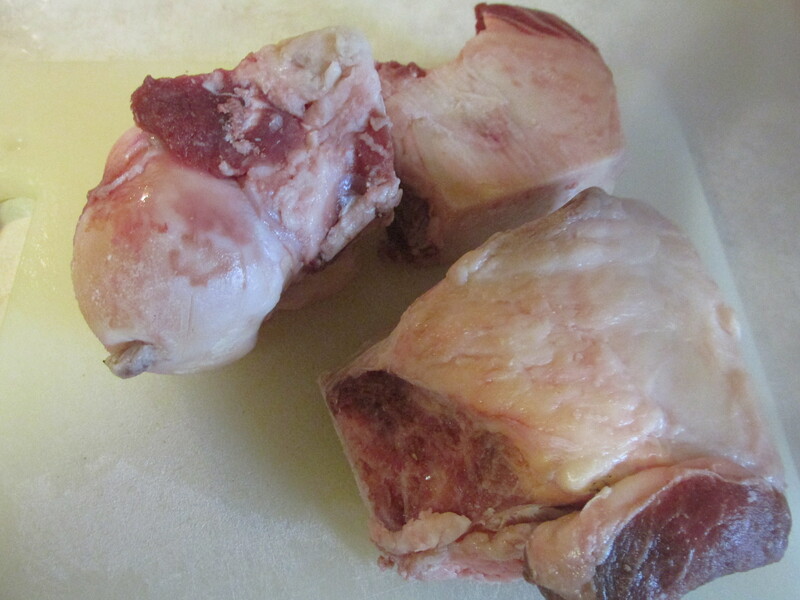 Fannie’s advised that making beef stock from bones without meat lacks flavor. Use marrow bones from the butcher if available. Request that these be cut into two-inch pieces. My local butcher didn’t have any marrow bones on hand, so he cut another bone into three chunks about the size of my palm. They weighed less than two pounds—the recipe called for two and half pounds with an equal amount of lean stew beef. I took what they had and purchased two and half pounds of stew beef. Preheat oven to 450 degrees to brown meat, bones, and vegetables. According to Fannie, browning all these ingredients before cooking adds flavor and color to the stock. The recipe calls for 3 sliced onions. Having already made chicken stock, I knew that vegetables are discarded at the end as they are limp from the cooking process. I decided to save time and cut the onions in halves. 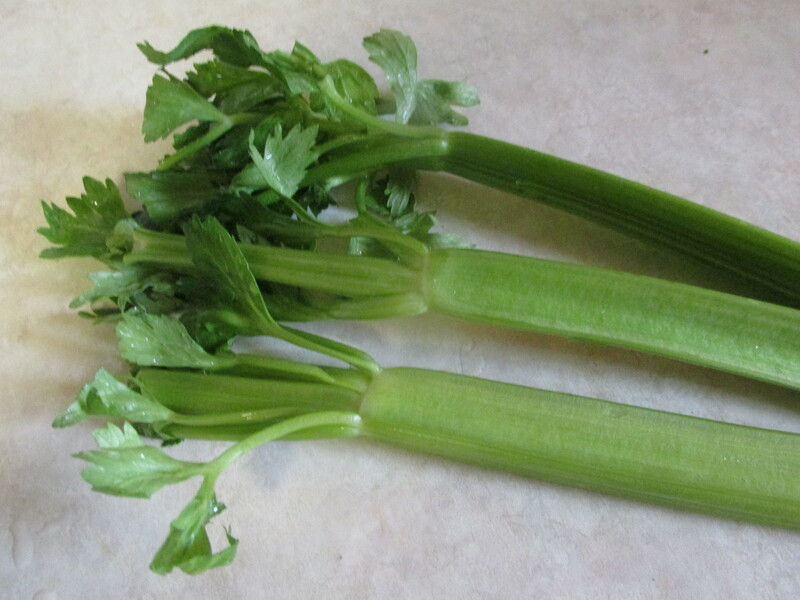 Three celery stalks were cut in half. I set aside the onions, celery, and nine baby carrots. 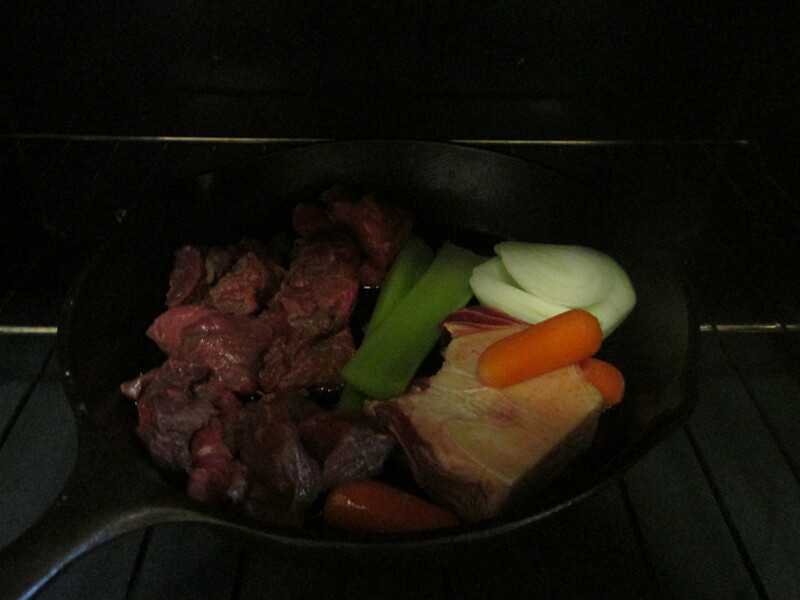 Fannie suggested using a roasting pan to brown the meat and vegetables in the preheated oven. In hindsight, that would be quicker because everything will fit at once. I used a cast iron skillet where all the ingredients didn’t fit. It took three different browning sessions to cook everything. Heat 2 tablespoons of shortening or oil in the roasting pan or skillet. Add the bones and stew beef. Stir and turn these frequently. Add the celery, carrots, and onions after 10 minutes. Stir the vegetables and watch so that they don’t scorch. When the meat is browned, remove everything from the oven. Carefully transfer meat, vegetables, and bones to a stock pot or large kettle. Add a cup of boiling water to the roasting pan and stir to get all the scrapings off the pan. Then add this to the stock pot. Add 1 teaspoon of dried thyme, a bay leaf, 2 sprigs of parsley, and 6 crushed peppercorns to the pot. Add 4 quarts of cold water. Cook on medium high heat until water begins to boil then reduce to simmer. Partially cover and simmer for 2 ½ hours. If you plan to use the stew beef in another recipe, remove it now and refrigerate for later use. I used a slotted spoon to take out the beef and scalded my hands a couple of times, so be careful. Continue simmering for another 1 ½ to 2 ½ hours. The total simmering time is four to five hours. Fannie suggests waiting to add salt until using the stock in a recipe. This allows for salty flavors of other ingredients. Should you choose to season the stock itself, add salt to taste just before it is done. Strain the stock and allow to cool, uncovered. Refrigerate or freeze until ready to use. I don’t generally use a lot of onion in my recipes. 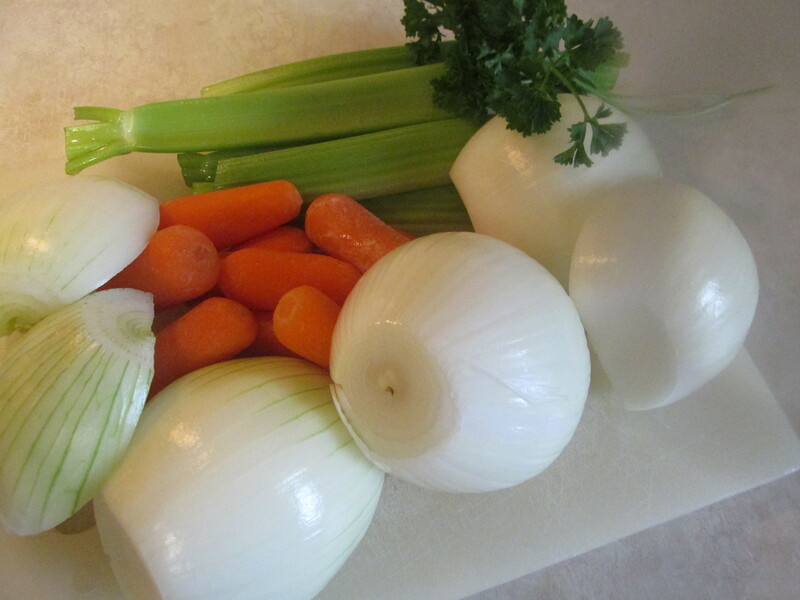 I will only use one onion the next time I make beef stock, but I wanted to try Fannie’s recipe her way. This stock is very aromatic while cooking. I will let you know how I use the stock and the beef in a future recipe and I’d love to hear from you, too! Revised by Cunningham, Marion and Laber, Jeri. The Fannie Farmer Cookbook, Alfred A Knopf Inc., 1983. Cait Sullivan loves training the horses on her father’s ranch and does not understand his decision to hire someone else Hall to do the with her—especially Jonas Hall, the man who broke her sister’s heart. Jonas excels at his job. He loves horses as much as Cait. The cavalry officer isn’t interested in the horses Cait trains, but will come soon to buy all the horses Jonas can train. Cait realizes the sale of the horses to the cavalry is their only chance to save her family’s ranch. The lovable, believable characters captured my heart as the story captured my interest. I enjoyed this historical romance. 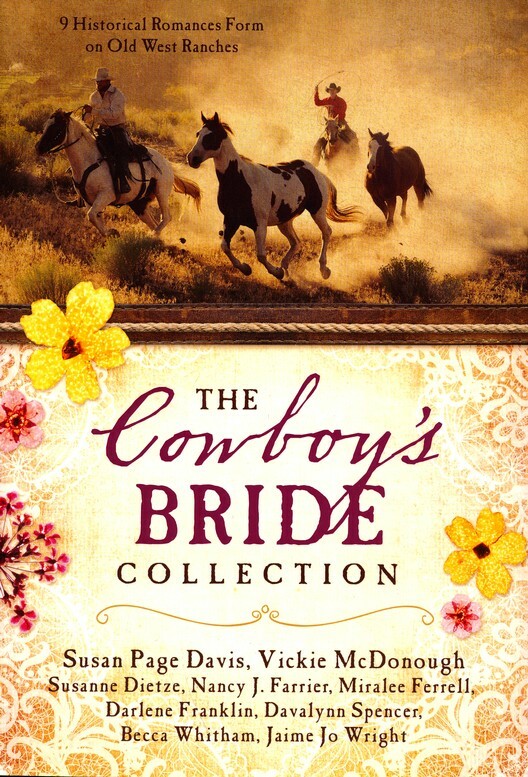 This novella is part of The Cowboy’s Bride Collection published by Barbour. Recent discussions among historical novelists about dialogue contractions prompted me to do a little digging. I pulled a variety of novels from my bookshelf that were written in earlier eras to discover how those authors handled dialogue contractions. The results surprised me. Read about them here. 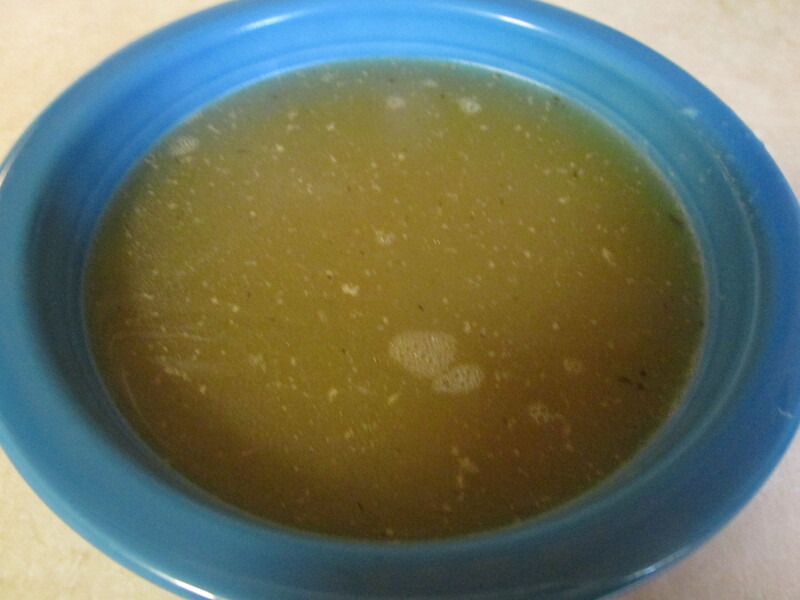 I prepared chicken stock using a recipe found in The Fannie Farmer Cookbook, giving me cooked chicken and chicken stock. I decided to make chicken gumbo soup. As Fannie warned, my chicken stock gelled in the refrigerator. Also, it had only made about 3 ½ cups of stock. I added enough water to make 4 cups into a large kettle. I warmed this over medium heat until in liquid form again. 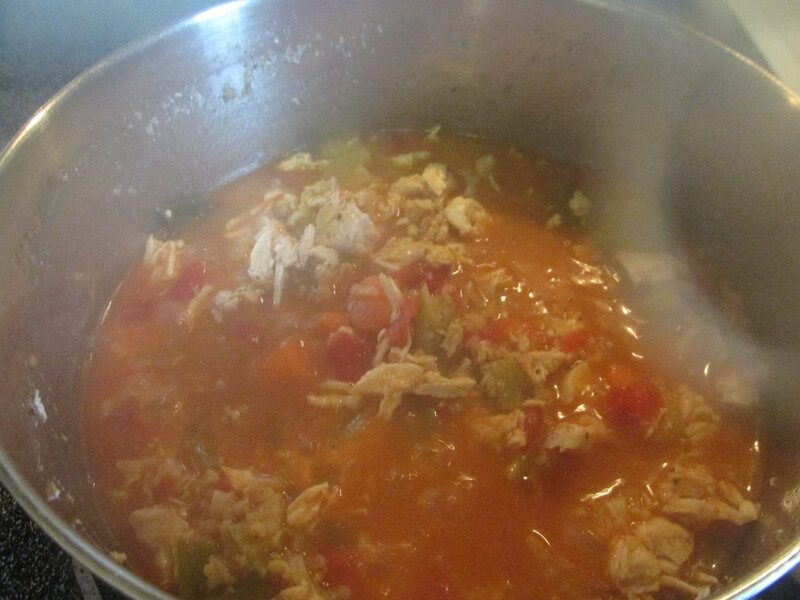 Add okra, celery, carrots, and tomatoes to the warmed stock. Stir in the uncooked rice. Cover and cook on medium heat for thirty minutes, stirring occasionally to keep the soup from sticking. Reduce heat to low. Add chicken. Salt and pepper to taste. 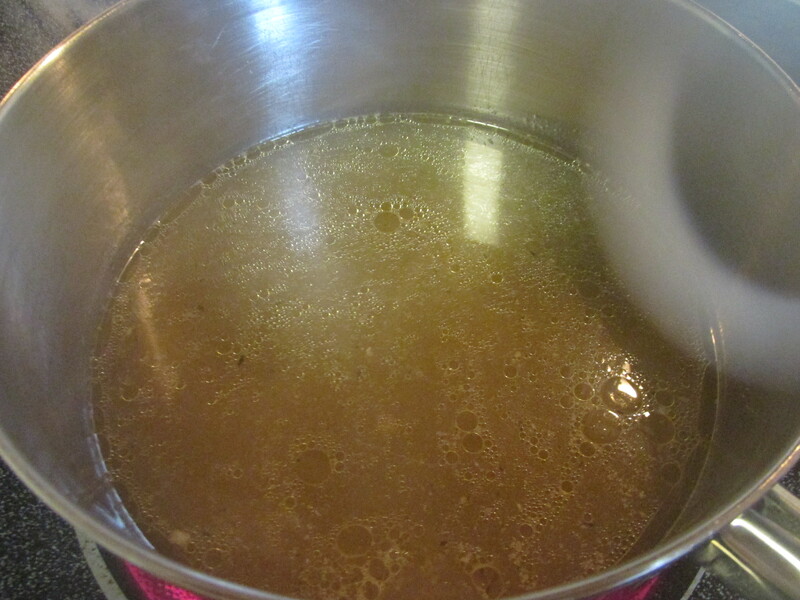 (Since I had not salted my chicken stock, I used a teaspoon of salt—the perfect amount for me.) Cook on low for about ten minutes to heat the chicken. Garnish with a little minced parsley, if desired. This made a hearty soup that I found delicious. One bowl is plenty for a meal. I think an extra cup of stock would have been perfect, so I will use 5 cups of stock next time. I’d love to hear from you if you try these recipes. Enjoy! Magnificent forests lined the hillsides and valleys in Colonial America. Their beauty didn’t make them easier to navigate. Pioneers blazed trails to the west by foot and then by horseback. Settlers heading westward during this time traveled before roads had been cut. Skinny paths left no room for wagons. They hauled their worldly possessions on pack horses. By tying each horse to the tail of the one immediately in front, one driver led a line of pack horses. Drivers controlled up to a dozen horses in one line. 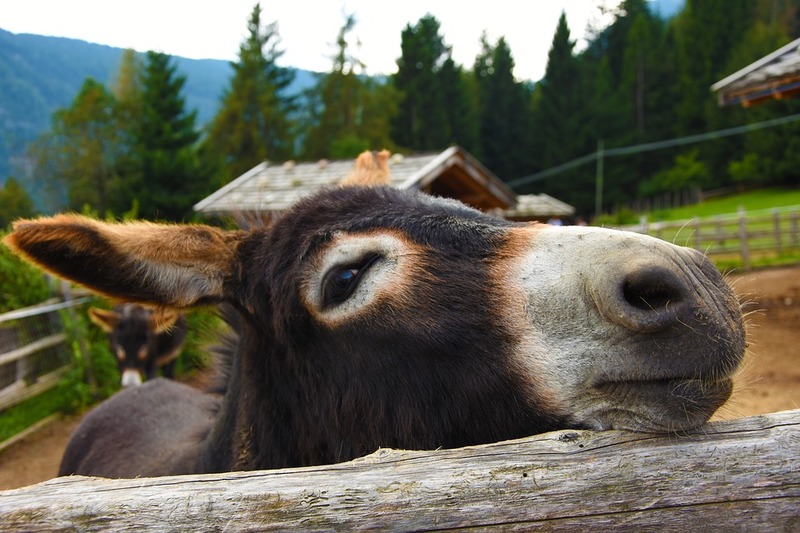 Each animal could carry up to two hundred pounds on primitive pack saddles. Pioneers created their own saddles using sturdy, forked limbs, trimmed to fit a particular load. Some frontiersmen made a living by selling their pack saddles in the back woods. Once these courageous souls settled in Western Pennsylvania or the Ohio country, they made yearly trips back east to sell their produce and replenish supplies. Traveling in caravans, they took ginseng, rye, bear’s grease, snakeroot, and hides back east. They returned with such goods as gunpowder, salt, nails, and iron. Early U.S. military operations utilized pack horse trains in traveling to confront Native Americans. Captain Robert Benham served as Conductor General of pack horses in the late 1700s, taking part in expeditions with Wayne, Harmar, St. Clair, and Wilkinson. While at Fort Harmar (near present-day Marietta, Ohio) in June of 1787, Colonel Harmar wrote that the cheapest cost of hiring pack horses was fifty cents a day. “Fort Harmar,” Ohio History Central, 2017/04/22 http://www.ohiohistorycentral.org/w/Fort_Harmar. Venable, W.H., LL. D. Westward by Hoof, Wheel, and Keel. Extracted from Footprints of the Pioneers in the Ohio Valley, originally published in 1888. Ronnie Spencer, a first responder, rescues firefighter Steve McNeal when his foot is pinned by a rock. She has avoided him since breaking up with him shortly after her father’s death. Steve had been working with her father the day he died. 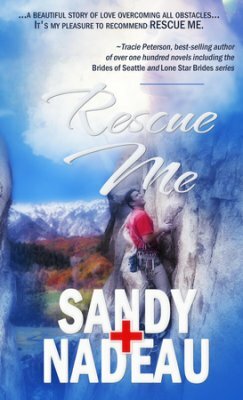 Her dad, as an experienced firefighter, never would have died if Steve had ignored orders and rescued him. Ronnie blames both God and Steve for not saving her father’s life. She refuses to date anyone who shares her dad’s profession. Who knew when they’d be killed? Circumstances and tragedies in their city throw the couple together. Steve loves Ronnie. How can he help her overcome her bitterness? This is a well-written contemporary romance that drew me in immediately. I recently ran across The Fannie Farmer Cookbook in an antique store. This book was originally published in 1896. Fannie Farmer’s name is still well-known today. Reading Fannie Farmer’s recipe for stock intrigued me. I’ve made chicken broth from chicken but realized that is different from Fannie’s chicken stock. Instead of making stock using chicken wings, necks, backs, and bones, I decided to use a whole chicken. 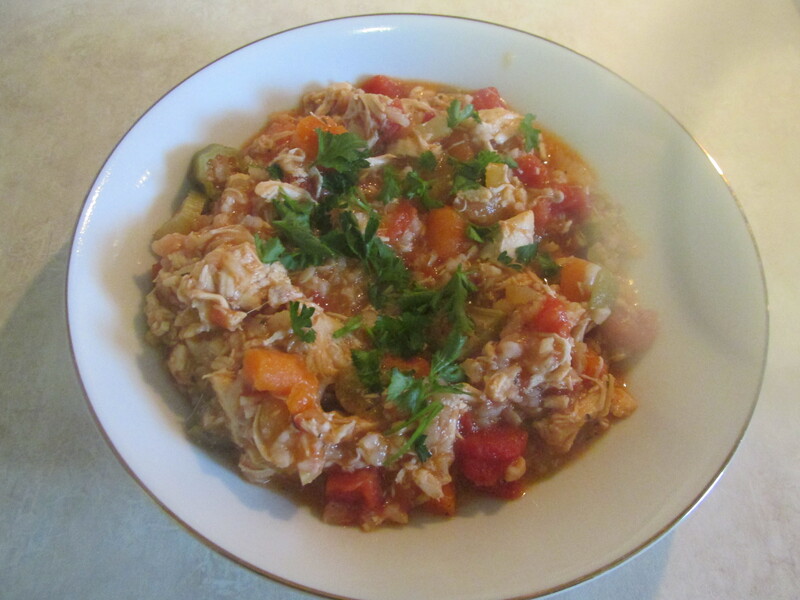 This gave me boiled chicken to make soup for an easy supper the following day. A local butcher cut up the chicken for me. Included in the package were the neck, heart, gizzard, and back. I used the legs, breasts, thighs, wings, neck, and back and discarded the rest. 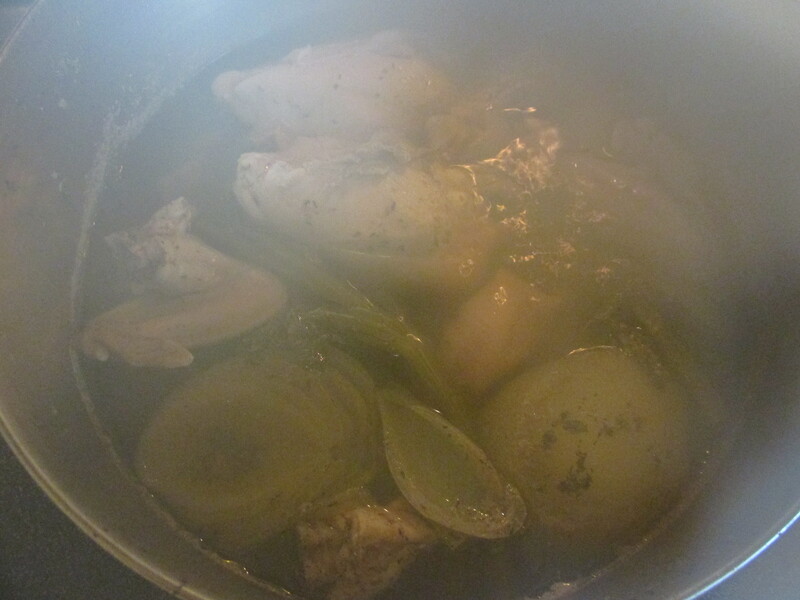 Wash the chicken and put into a large pot, holding out the breasts and wings to be added later. Add eight cups of cold water. Cut one peeled onion in half and place in the pot. Add six baby carrots or peel two carrots and cut them into thirds. Slice in half three celery stalks, including the leaves. Add a bay leaf, a teaspoon dried thyme, and six crushed peppercorns. Cook on medium high heat until water begins to boil then reduce to simmer. Since white meat cooks more quickly than dark meat, add breasts and wings after the stock has simmered for twenty minutes. Cover and simmer until chicken is done. Mine was ready in about an hour. Remove chicken from pot. Debone. Add bones and skin back into the stock and continue simmering. Refrigerate the chicken for later use in another recipe. The total simmering time is four to five hours, which includes the time it takes to cook the chicken. Strain the stock and allow to cool. Refrigerate or freeze until ready to use. Stock made from bones will gel in the refrigerator. 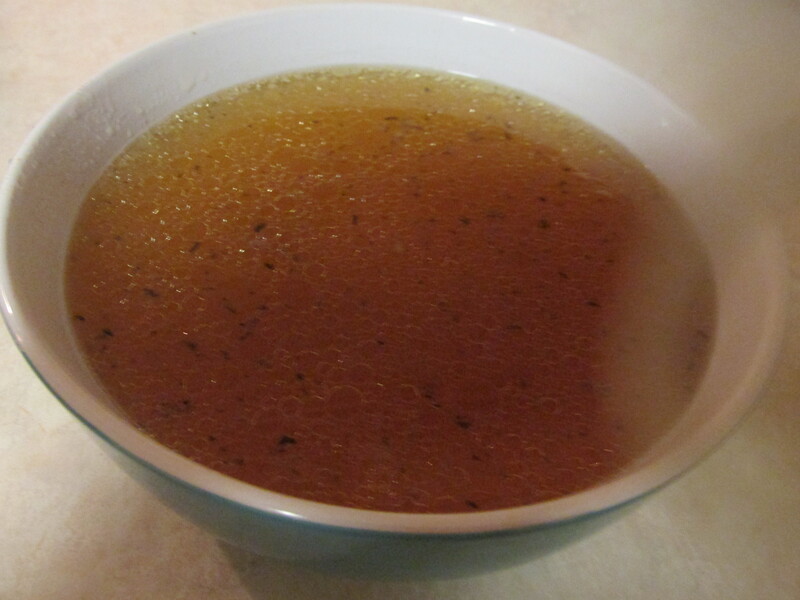 When the broth thaws out, skim off the top layer of fat. This smells and tastes delicious, even without salt. The stock smells so aromatic and appetizing that your family may be hungry for supper a little early. George Washington’s vision for a major road westward likely built over time. The Ohio Company of Virginia owned a trading post on the Monongahela River, which is now Brownsville, Pennsylvania, in the 1750s. George and his half-brother Lawrence were members of this organization that hired Colonel Thomas Cresap to oversee the blazing of a trail from Cumberland, Maryland, to its trading post in 1752. Cresap hired Delaware Indian Nemacolin who performed the task. The new trail was called Nemacolin’s Path. The following year, the French occupied Fort Le Boeuf (currently Waterford, Pennyslvania), an area in British territory. Major George Washington, sent by Virginia Governor Robert Dinwiddie to order them to leave, rode his horse over the future National Road. The French ignored the warning. In 1754, Washington commanded a small army with orders to remove the French from Fort Duquesne (Pittsburgh.) Washington’s small army traveled over ground that would become the National Road. He was ambushed and eventually surrendered. As aide to British General Edward Braddock, Washington again found himself traveling toward the French at Fort Duquesne in 1755. Braddock ordered 500 axmen to clear a road for his supply wagons and infantry. The army was ambushed again and Braddock was killed. 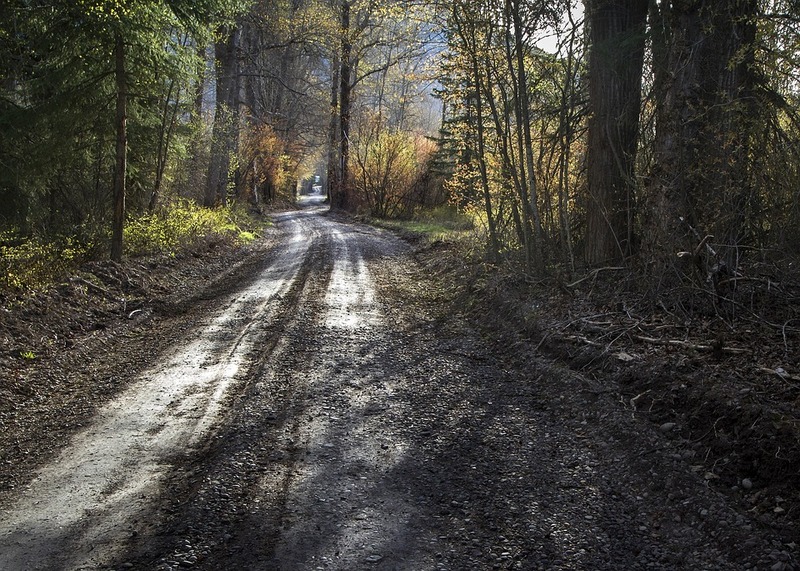 The road his army blazed, marked by stumps and brush, was called Braddock’s Road. It ends near Pittsburgh. Early pioneers preferred packhorse trails over the rough road. 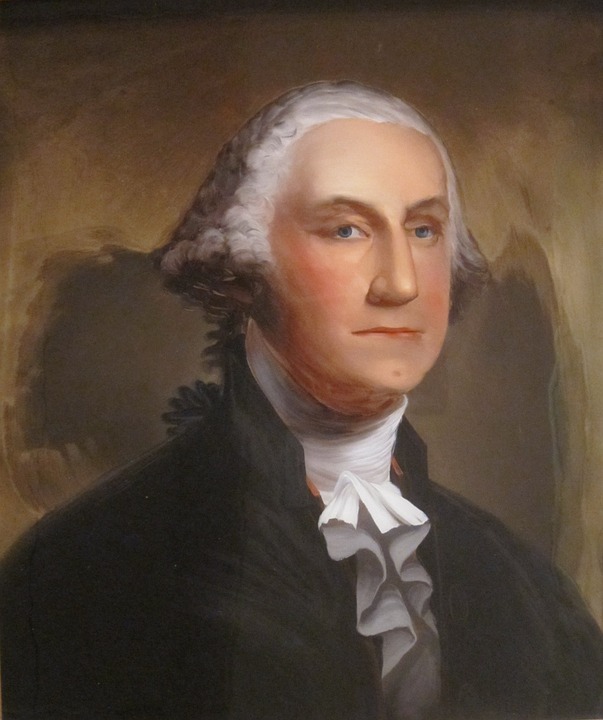 After the Revolutionary War in 1784, Washington focused on his western holdings. He took the same difficult route westward as he’d taken in 1754. Then he called a meeting at a land agent’s cabin on the Cheat River (currently Morgantown, West Virginia) in September of 1784. 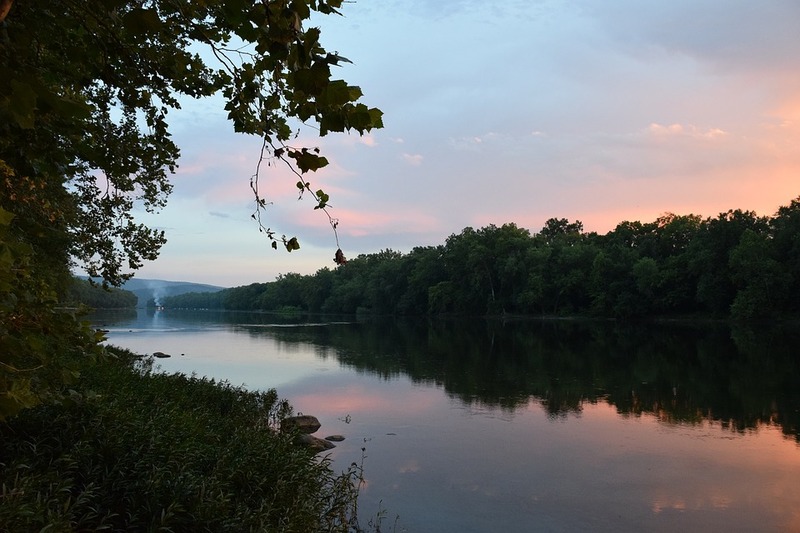 He asked for opinions on the best route between the upper Potomac to an Ohio River tributary. A young surveyor, Albert Gallatin, was present at that meeting. He surprised Washington by agreeing that a passage through the mountains of northwestern Virginia (now West Virginia) was the best route. Washington agreed. Our first President died in 1799 without seeing his vision for a national road realized, but Gallatin didn’t forget. President Thomas Jefferson selected him to become Secretary of the Treasury. One of Gallatin’s duties was the disposition of western public lands. Congress voted on March 29, 1806, to lay a road from Cumberland, Maryland, to Ohio. 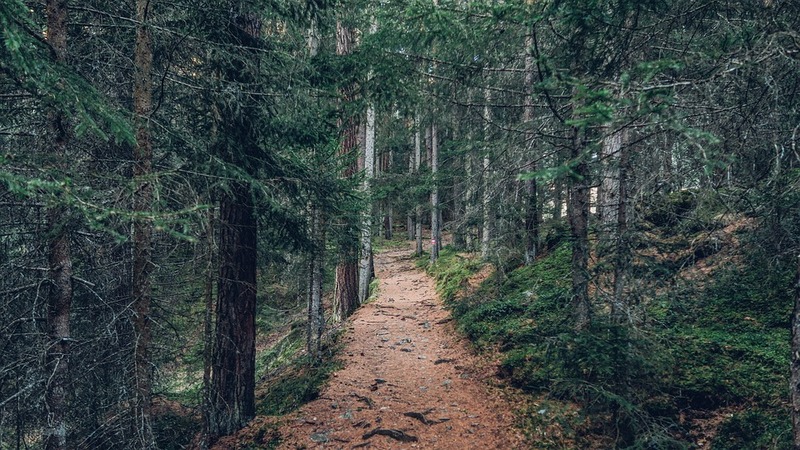 Perhaps Gallatin thought of a long-ago meeting in the Virginia wilderness with a famous Revolutionary War general and future President as the National Road was voted into law.